Our first Audet ancestor in New France was Nicolas Audet, the son of Innocent Audet and Vincente Roy. He was born in 1637 and baptized on July 12th of that year in St. Pierre parish in the village of Maulais, Deux Sevres, in Poitou. This is now part of Taize in the district of Thouars. Nothing is known about Nicolas' early life. The first record of him is his confirmation which occurred in Quebec on March 23, 1664. Bishop Laval performed the ceremony. Presumably, he arrived in New France sometime in 1662 or 1663. In the church entry, his home parish in France is identified as St. Mathurin in Poitou. There were several parishes of that name in the general area of Poitou at the time. The entry does not mention the Lapointe dit name. 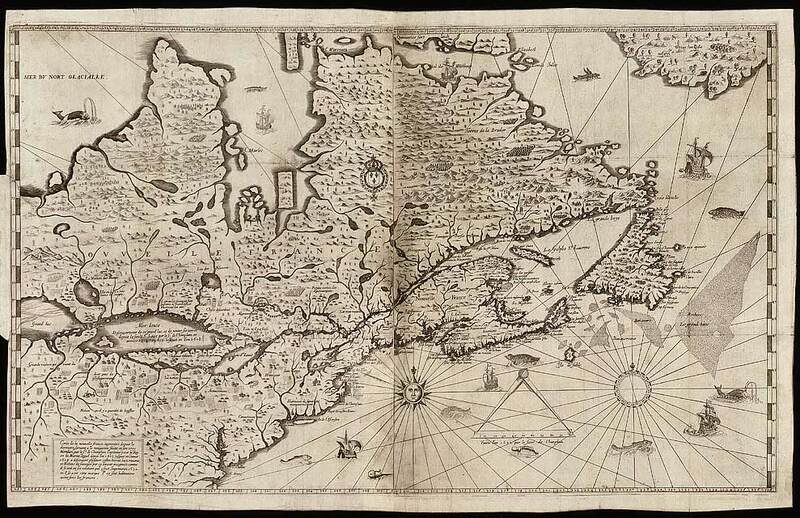 No further record of Nicolas has been found in Quebec between 1664 and 1666. However, it has been stated by some researchers that Nicolas was in the French Army in 1665 and 1666. The King sent about 1000 troops to Quebec in 1665 to quell the Iroquois uprisings. These troops were supplemented by members of the local militia and settlers. It is believed that Nicolas was still in Quebec at the time. The records show that Nicolas was a member of the Monteil Company which was composed of soldiers from Poitou. All of the soldiers who were assigned a dit name in this company had such a name beginning with "L". This was an easy way of identifying the company to which the soldiers belonged. Nicolas' dit name was Lapointe. This is the first known record of the Audet dit Lapointe name in New France. The only other possible explanation for Nicolas' army service is that sometime after his confirmation in 1664, he returned to France and then joined the army prior to its assignment to New France. I believe this unlikely since Captain Tracy, the leader of the Monteil Company, sailed with his troops in early 1664 for the West Indies prior to being rerouted to New France to join the larger Salières Carignan force which sailed for Quebec in 1665. When the Indian wars ended in 1666, Nicolas was among the 400 soldiers who remained in Quebec as settlers. In the census of 1666, Nicolas (listed as Lapointe) was a labourer, one of 12 employees of Bishop Laval working on his lands at Saint Joachim near Cape Tourmente, Beaupré. On 22 June 1667, the Bishop, who owned extensive seigneurial lands, granted Nicolas three arpents of frontage on the south side of Île d'Orléans along the Saint Lawrence River in Sainte-Famille parish. Twelve years later, this land would become part of the newly-created Saint Jean parish. Each year on November 11th, he was required to pay to the Bishop in payment for his land, 20 sols in seigneurial rent for each arpent, 12 deniers for "cens" and 3 capons chosen by the Seigneur. He also probably had to have his grain milled at the Bishop's mill. The land grant contract was witnessed by notary Paul Vachon, Jean Crete, master cartwright, Paul de Rainville, sheriff of Beauport, and Bishop Laval himself. It seems Nicolas had become well known and connected. "Today, at the entrance gate of the estate, Sieur Jean Madry rang a little bell, in response to which he was met by Nicolas Audet, porter of the Château. After admitting him, Audet went to inform his master, the Bishop." As Nicolas was gainfully employed, presumably he had his house constructed on his lands and perhaps had left Quebec to be a farmer. The only thing remaining was to find a wife to help with the farming chores and to build a family. Here, the filles du roi program came to the rescue in the form of Madeleine Després. Madeleine was born about 1653 in St. Sauveur parish in Paris. She was the daughter of François Després and Madeleine Legrand. She was sponsored as a fille du roi by Anne Gasnier and brought with her a dowry of 200 livres in addition to the usual other provisions gifted by the King. Madeleine arrived in New France in 1670. How the two met was most likely in the usual way – a form of parade of eligible women and men and an interrogation of sorts. Likely, Nicolas' connection with the Bishop assisted in supporting a good impression. On August 30, 1670, Nicolas and Madeleine met at Quebec with notary Romain Bequet, who drew up a marriage contract. Anne Gasnier and Elisabeth Etienne were witnesses. They were married on September 15th in Ste. Famille Parish, the only church on Île d"Orléans at that time. The witnesses were Pierre Rondeau and Mathurin Dube, the latter another of our ancestors. The couple had twelve children, nine boys and three girls but the elder two died young. All were baptized in the Parish of Sainte-Famille except the youngest three who were baptized at Saint-Jean, after that parish was created. By 1681, Nicolas had acquired more land. In the census for that year, he indicated 15 arpents cleared for cultivation and he owned six horned animals (probably oxen and cattle) and a gun. In 1689, Nicolas became gravely ill. He was hospitalized for 19 days in August and in September, he spent 26 days under the care of the nursing sisters at Hôtel-Dieu in Québec. On July 9, 1696, he was awarded another land grant of three arpents of river frontage in St. Laurent, some distance to the west of his farm. Two years later, he gave this land to his son Jean-Baptiste. Nicolas died on December 9, 1700 and was buried the next day at the St. Jean cemetery. The family farm and the obligation to care for Madeleine were passed on to his son Joseph. An inventory of family assets was made by notary Etienne Jacob on September 27, 1706. It listed 75 arpents of usable land, a two-room, 18x24' house with two chimneys, a cellar and loft, and finished in rough beams, plus a barn and stable. The farm was located at lot numbers 192 and 193 of the cadastral plan of St. Jean parish. The census page shows an entry for Nicolas Audet (shown as La Pointe), age 27, one of the 12 employees of Bishop Laval working and living on his lands at Saint Joachim near Cape Tourmente in the Beaupré. 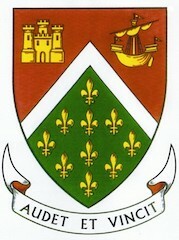 Bishop Laval granted Nicolas Audet three argents of river frontage on the south side of Ile d'Orléans in Ste. Famille parish. The lands stretched about 2 kms to the median line which bisects the Ile east/west. Nicolas Audet is the sixth last in the left column shown as "La Pointe"
Nicholas Audet - inventory was made by notary Etienne Jacob, on 27 September 1706. Page taken from Notary Paul Vachon's index of contracts; there is one listed for Nic. Audet ( the 10th last) another for Nic. Audet dit Lapointe (the 7th last). A list of our Lapointe great grandparent ancestors (husbands and wives) who were the first of their families to settle in New France, mostly in the 17th century. 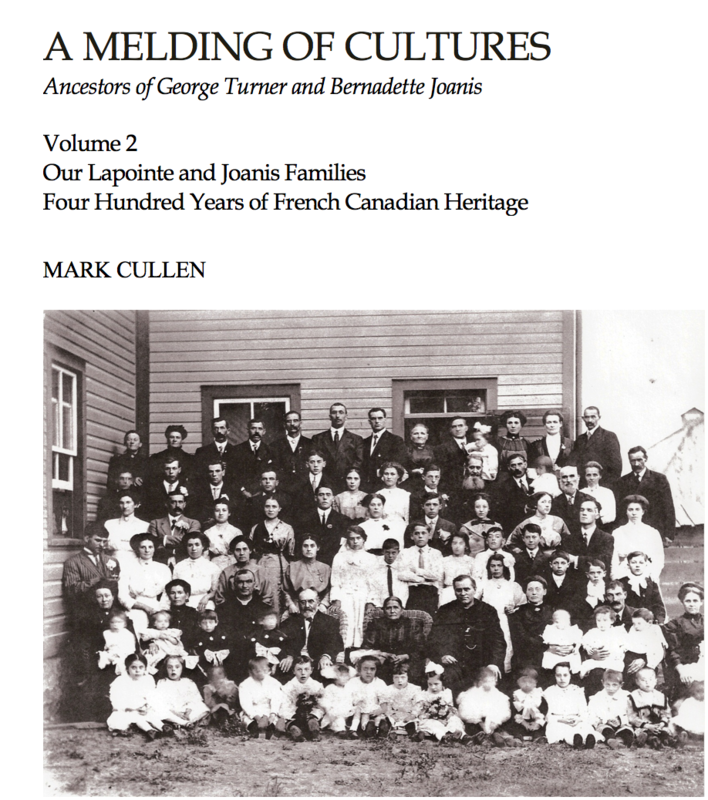 Revised excerpt from A Melding of Cultures Ancestors of George Turner and Bernadette Joanis, Volume 2: Our Lapointe and Joanis Ancestors Four Hundred Years of French Canadian Heritage, Mark Cullen, Vancouver, 2018, Appendix 1, pp 125-126. [S141] Dictionnaire genealogique des familles Audet dit Lapointe, page 21. [S141] Dictionnaire genealogique des familles Audet dit Lapointe, Page 19.